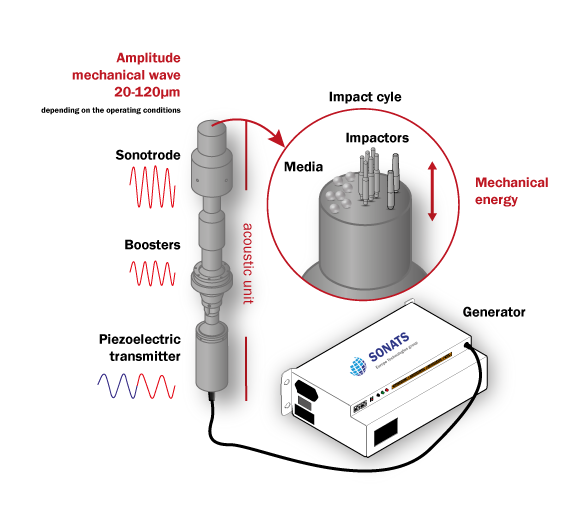 SONATS created the STRESSONIC® peening process to improve the fatigue resistance of metal parts. It is a mechanical cold impact treatment of the surface of metallic components or structures. Surface treatment applications include shot peening, ultrasonic needle straightening or peen forming, and weld impact treatment. The STRESSONIC® generator digitally creates an ultrasonic range frequency (20 kHz) sine wave. A piezoelectric transmitter converts this wave into a low amplitude mechanical wave. This wave is then increased by a succession of boosters stages and by the sonotrode. The mechanical energy resulting from the vibration of the sonotrode is then transmitted to a free-motion medium projected against the metal part to be treated. The media may be beads placed in a chamber (shot peening), or it may be needles/impactors (straightening, impact treatment). Ultrasonic waves are not transmitted to the part to be treated. Depending on the operating conditions, the vibration amplitude of the sonotrode can range from 10 to 250 μm (peak-to-peak). All parameters of the mechanical impact treatment process and its environment are fully controlled. Ultrasonic signal: High precision digital generator. Media: The quality of the material is controlled. The mass is constant, as is the number of beads in the chamber. Kinetic energy: The amplitude and frequency control allows a very precise control of the kinetic energy of the media. Environment: The chamber defines the processing volume, and indirectly the media trajectory, thus ensuring that there is no variation among parts. Reproducibility of the process is ensured, from one part to the next. The process is fully controlled and automated. Media: High quality materials, perfect geometry and perfect composition. Low roughness result compared to conventional shot peening processes. Improved tribological performance of some parts, particularly gears. Clean process, no dust or waste. Low material consumption (a few grams, while conventional shot peening uses up to several hundred kilograms of media). Clean process creating no dust or waste, no subsequent cleaning operations. No risk of damage to customer parts. No danger to the operator. Less risk of Musculoskeletal Disorders (MSDs) for operators. ATEX risk reduction (risk of dust explosion).